Greetings and welcome. 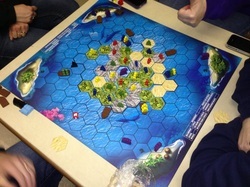 Keystone Gamers is a page for Board Gamers in the Lewistown, PA and surrounding areas. We also welcome anyone who would like to come and join us from other areas. We seek to have fun in a relaxing atmosphere, we ask everyone participating treats everyone else with respect and keep in mind - these are games we are playing. We have a lot of games between us, and are always interested in learning and playing new ones. We will be having public events for members and non-members to come and enjoy (bring your friends)! Membership is free as is participating in playing the games available that night. Remember, these are peoples personal games, so please treat the games with respect. The games we have range from old standby classics (risk, monopoly, chess) to bookshelf type games. We are really open to anything and are more than willing to try one of your favorites. Keep in mind that if you bring a game no one has played before, you will need to teach us. By the same token, we are more than willing to teach you how to play a game so you may enjoy it as well. Or... Come play with us! **Other gaming opportunities available check the facebook group for details.